Septic systems, including aerobic septic system repairs, conventional septic systems and low-pressure dosing septic systems. Big Bexar Septic specializes in residential and commercial septic service in San Antonio and the surrounding Hill Country. 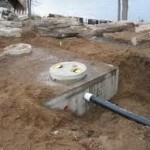 We offer septic tank installation and service, including septic tank pumping and septic tank cleaning. Big Bexar Septic also performs real estate inspections for agents and potential buyers. We take pride in our work and we look forward to earning your business. As a courtesy to our customers, we will always offer a free estimate for any of the services that we offer. If you are a home builder or are planing an RV Park or Oilfield Housing area Big Bexar Septic can help you with your septic tanks. Specific needs for RV park septic systems or oilfield septic systems and new construction septic systems are well within our scope of experience and capability. To learn more about our services and all the ways in which we can assist you, please contact us today. When scheduling service with us, please be sure to inquire about our available discounts for senior citizens and both active duty and retired military personnel. Common Septic System Service Categories are; septic tank pumping, septic tank cleaning, drain field inspection, septic system cleaning, septic system pumping, septic system repair, aerobic septic system repair, septic system service, septic service, and septic tank repairs, conventional septic system repair and low-pressure dosing septic system repairs. 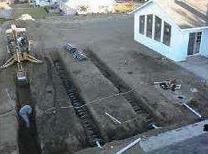 All septic system service provided by Big Bexar Septic is done by experienced hands. 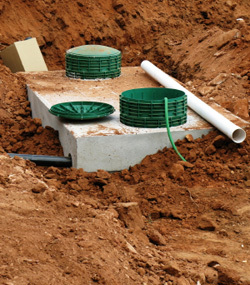 We can also assist you with design and installation of your septic system in San Antonio and the surrounding areas. An issue that many RV parks or LCSS system owners encounter is the odor issue. Many RV drivers, or uninformed septic tank users pour chemicals down their drains, which end up in the RV Park septic tank. A 15,000 gallon tank with 20 to 30 RVs who are not instructed in proper septic tank use can run into a real problem. Adding urea to mask the ammonia smell, coming from the LCSS septic system will only hide the problem and not fix the issue. Often times a loose cap, or a main vent that is too short is the cause, providing visitors to the RV park with clear instructions, including photographs may help your RV visitors change their ways. 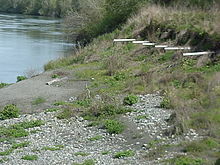 A septic drain field, also can be referred to as a leaching field. The primary job of the septic drain field is to filter the effluent from the septic system, once the septic tank has decomposed the waste within. Different sizes of drain fields are required depending on the capacity of the septic tank and the concurrent rating of the septic tank system. Practically speaking the higher capacity this septic tank, and did more users per day, the larger the septic drain field will need to be. Over the course of time a drain field can either deteriorate, by the force of erosion or due to the septic system capacity increasing and the leaching or drain field not increasing in size. A drain field rated for five users obviously cannot support 20 users without encountering problems during filtering of effluent. Septic drain field repair is possible and is a problem Big Bexar Septic is experienced with. If your septic field is marshy or swampy, or you are unable to remove sewer odors even after pumping and cleaning your septic tank, the septic drain field is likely your culprit. A percolation test of the soil in your proposed or current septic drain field should be performed by an experienced septic tank installer. The picture below speaks 1000 words. 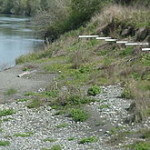 It is an example, an extreme example of drain field damage caused by erosion. This type of issue with the drain field is repairable. If you need the best drain field repair San Antonio has to offer call Big Bexar Septic. We are here to help and leverage our experience to solve your problems with your septic tank economically, efficiently and quickly. If you need Septic System Design San Antonio can count on, call the professionals at Big Bexar Septic. your lot type and septic system capacity are the main factors in deciding upon the design of your septic system. If you have a sloped or hilly lot as many of us do in the Hill Country. A low-pressure dosing system may be the right fit for you. 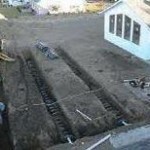 If you have a flat lot the most cost-efficient type of system is the conventional septic system. Depending on the soil and the perk tests this is an optimal choice for anyone in South Texas looking for a septic system. if you have poor soil or dense limestone just beneath the surface of the soil on your property an aerobic septic tank may be the right choice for you. And aerobic septic system requires electricity and water. Big Bexar Septic offers reasonable rates for backup service if your soil is rocky and requires jackhammering in order to make room for the piping in your septic systems drain field. Although septic systems are simple in design, technically they can be complicated and a miscalculation during the design process can cause your septic tank installation job to go wrong. 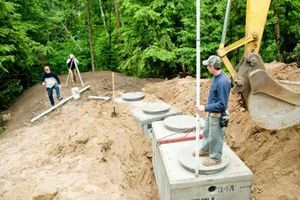 Depending on the size and scope of your new construction project you may need assistance with your septic tank systems. If you want the best when it comes to Septic New Construction San Antonio call Big Bexar Septic. Big Bexar Septic can install Conventional, Aerobic, Low Pressure Dosing Septic Tanks Systems and other Waste Water Treatment Facilities. Big Bexar Septic can help you with. Call Big Bexar Septic today and ask for Jason or Nick. You’ll be sure to get an experienced ear on the line and a quick response for any septic or waste water emergencies at these type of construction sites. Big Bexar Septic also offers backhoe service for septic installation if you only need experienced hands for the install-dig and not the plumbing, design, planning or electrical portion of your septic tank installation. Big Bexar Septic is your partner for design, planning, installation and maintenance of the septic system that is required for your site. Regular scheduled septic system maintenance contracts, will eliminate your headaches after ground has been broken and years have gone by. Septic tanks require maintenance and Big Bexar Septic can provide the septic system maintenance contracts for your new construction development. 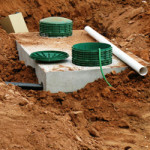 Septic System Installation San Antonio can count on, Big Bexar Septic has installed thousands of septic tanks in San Antonio, TX. This experience coupled with the right design by Big Bexar Septic means you get this septic system you want, at the price you like, done right the first time. Big Bexar Septic will determine the correct type of septic system for your property and install your septic tank in an efficient and professional manner. Experience brings speed as you may have a Low Pressure Dosing Septic System, Conventional Septic System or Aerobic Septic System installed, all of these types of septic systems require experienced hands and design backed by in the field, time-tested knowledge of septic systems. Big Bexar Septic provides all materials, labor, tools and if necessary backhoes for your septic tank installation. 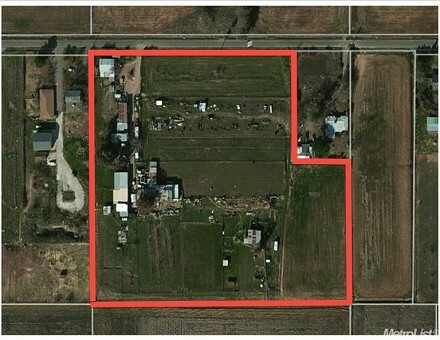 If you live in the hill country around San Antonio you may have a hilly lot, your lot type will be a factor during your septic system installation, as well as perc tests of the soil on your property. 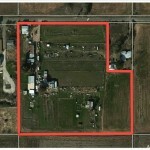 These are large factors in placement as well as any existing structures on your property. 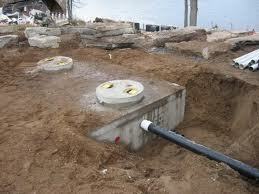 For more information about septic system installation contact us.